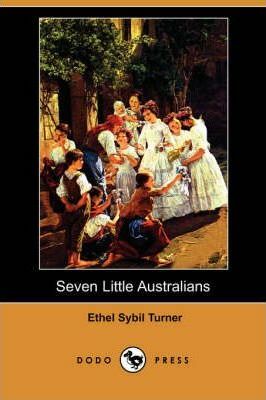 Ethel Sybil Turner (1872-1958) was an Australian novelist and children's writer. She was educated at Paddington Public School and Sydney Girls High School. She started her writing career at eighteen with her sister Lilian. Her best-known work is her first novel, Seven Little Australians (1894), which is widely considered as a classic of Australian children's literature. The book deals with the lives of the Woolcot family, particularly with its seven mischievous and rebellious children. It is the only Australian children's book that has been constantly in print over the last 100 years. The success of Seven Little Australians led to the popular sequel The Family at Misrule (1895). Other books followed such as Little Mother Meg (1902) and Judy and Punch (1928) which further chronicled the exploits of the Woolcot family. Ethel Turner has been awarded a number of prestigious literary awards and can easily be classed as one of Australia's best-loved authors. She wrote more than 40 novels. Some were about the mischievous Woolcots. Others were serialized like her books on the Cub and some were stand-alone.